Includes PPT visuals for flashcards, memory verses (ESV and KJV), Pete Menjares mission story and words to suggested songs: Amen (2 Peter 3:18), Casting All Your Anxieties (1 Peter 5:7), New Creation (2 Corinthians 5:17), Christ Redeemed Us, His Name Is Jesus, Jump, No Turning Back. PDFs of lesson text and other helps: teaching cards, resource booklet, Wonder Time teaching, PPT games, preschool helps, reproducibles (quiet time sheet, memory verse bookmarks, coloring sheets, sheet music for songs)--everything in digital format that is in the printed resource pack. PowerPoint to teach six lessons about the life of Jesus from birth through the beginning of His early ministry. (Replaces Life of Christ 1.) Includes PPT visuals for flashcards, memory verses (ESV and KJV), Cameron Townsend mission story and words to suggested songs: Books of the Old/New Testament, Christ Redeemed Us, God's Way, Jesus Is Caring for You, Let's Get Started, Keep Your Way Pure (Psalm 119:9-11). PDFs of lesson text and other helps: teaching cards, resource booklet, Wonder Time teaching, PPT games, preschool helps, reproducibles (quiet time sheet, memory verse bookmarks, coloring sheets)--everything in digital format that is in the printed resource pack. PowerPoint visuals to teach six lessons for Jesus: God Who Saves. PPT visuals include flashcard visuals, memory verses (ESV and KJV) and words to suggested songs. 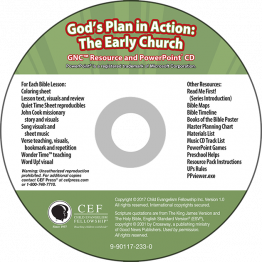 Includes additional GNC resources: Word-Up visuals, master planning chart, resource, preschool plan, booklet, Books of the Bible poster, map, time line, time line pictures, map pictures, reproducible coloring sheets, Quiet Time sheets, UPS rules and mission story of Martin and Gracia Burnham. PowerPoint visuals to teach six lessons for the God's Church Expands: The Ministry of Paul series. PPT visuals include flashcard visuals, memory verses and words to suggested songs. 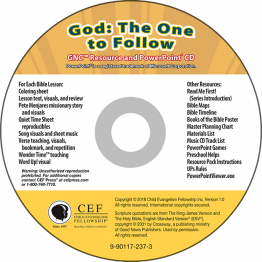 Includes additional GNC resources: Word-Up visuals, resource booklet, Books of the Bible poster, map, time line, time line pictures, map pictures, missionary story Special Job for an Ordinary Boy, coloring sheet, UPS rules.